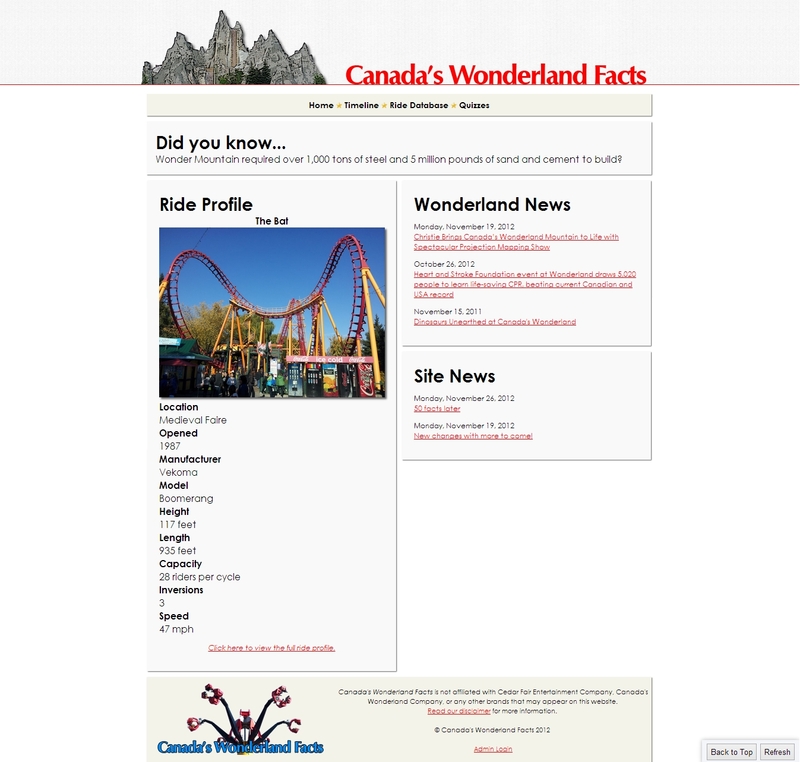 Canada’s Wonderland Facts was my most recent website. The purpose of the site was to create a resource full of information about the park. No rumors. No forums. Just facts. I wanted some interaction so I had plans for things like quizzes and a rating system. This was another case of being too ambitious and giving up when it became too much. It was online for only about a month but it’s probably the project I’d go back to if I were to get back into building websites. As you’ve seen in my past posts in the website tour, it’s usually a hit or miss when it comes to the visual appearance of my sites. With the combination of the CSS tricks I learned in recent years and experimenting with jQuery effects, I thought I came out with a really clean look. I was happy that it didn’t take a redesign to do that like in my past sites. Just like with More Than Starlight, the database didn’t have enough content on it. Other parts of the site was alright. The timeline is complete up to 2012. The random facts database isn’t too bad either. I occasionally go back in, by running the site locally, and add new facts and things to the timeline. I really would love to revisit this site one day or at least throw it back online for fun, but I’d really need to get the plan for the site in order before I do. If and when that day comes, at least it wouldn’t be too outdated. So those are my websites. To see the entire tour, click the Web Design category on the sidebar. Thanks for reading!